Our products related to the world of music: musical notes and signs, dancers, musical instruments, etc. You will find stickers for scrapbooking, buttons with different musical forms, and themed ribbons and fabrics for patchwork. 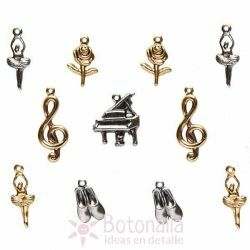 Product Description: Embellishments related to dancing and music. These are charms with a small hole at the top to help fix them to your sewing or scrapbooking project. Content: 11 embellishments silver or golden color. Diameter: from 14 to 23 mm. Material: metal. 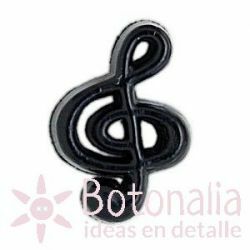 Product Description: Decorative button with the shape of a treble clef in black color. Perfect for patchwork and scrapbooking projects, as well as any other sewing or craft projects.Content: 1 Button.Diameter: 20,5 mm approx.Material: Plastic. Button with the shape of a musical note in black color. Perfect for needlework projects or patchwork, as well as scrapbooking, card making and other crafts.Content: Price is per unit.Diameter: approx. 18,5 mm.Material: Plastic. Button with the shape of a musical note in black color. Perfect for needlework projects or patchwork, as well as scrapbooking, card making and other crafts.Content: Price is per unit.Diameter: approx. 17,7 mm.Material: Plastic. Button with the shape of a lira in black color. Perfect for needlework projects or patchwork, as well as scrapbooking, card making and other crafts. Content: Price is per unit. Diameter: approx. 22,7 mm. Material: Plastic. 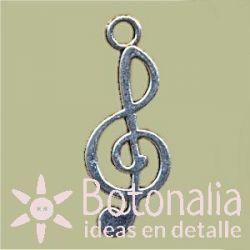 Product Description: Metal embellishment with the shape of a treble clef. For sewing or craft projects.Content: 1 pendant embellishment in silver color.Diameter: 24 mm.Material: Metal (Tibetan silver alloy). Button with the shape of a musical note in pink color. Perfect for needlework projects or patchwork, as well as scrapbooking, card making and other crafts.Content: Price is per unit.Diameter: approx. 17,7 mm.Material: Plastic. Product Description: Button with the shape of a musical note (treble clef) in pink color with a contour in white.Content: Price is per unit.Diameter: 23 mm.Material: Plastic. Product Description: Button with the shape of a musical note (treble clef) in pink color. Perfect for patchwork and scrapbooking projects, as well as any other sewing or craft projects.Content: Price is per unit.Diameter: approx. 19 mm.Material: Plastic. Decorative button with the shape of a pair of ballet slippers in pink color. Perfect for needlework projects or patchwork, as well as scrapbooking, card making and other crafts.Content: Price is per unit.Diameter: approx. 25,5 mm.Material: Plastic.